What can the Cretaceous tell us about our climate? The Cretaceous period features a particularly interesting climatic episode in the Earth’s geological history. It follows the Jurassic Period, better known as the time the dinosaurs inhabited Earth and spanned the period between 145.5 and 65.5 million years ago. The Cretaceous is the last period of the Mesozoic Era, which ends with a well-known mass extinction event. At the end of the Cretaceous, an asteroid hit the Earth in the Yucatan Peninsula, Mexico, forming what is today called the Chicxulub impact crater (2). It has been estimated that half of the world’s species became extinct around this time, but no accurate species count exists for each group of organisms. Figure 1 represents an artistic representation of how we imagine the Cretaceous landscape looked like.The supercontinent Pangea, which already started to rift apart in the preceding period, continued to diverge. 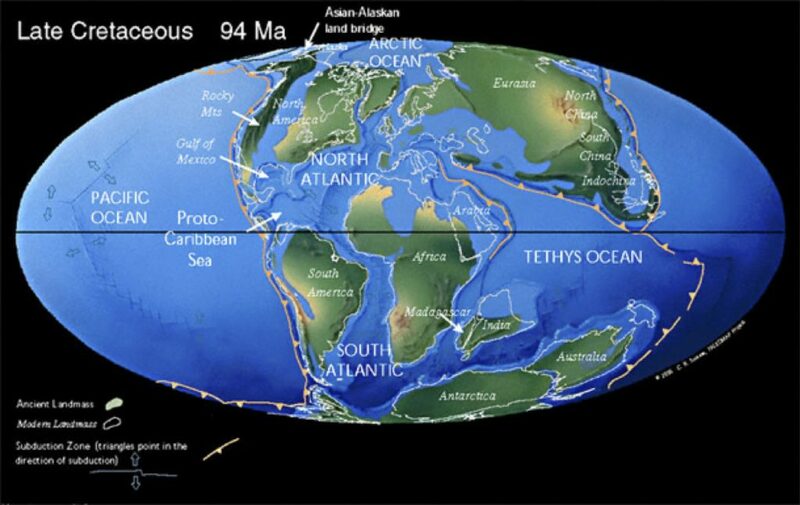 By the mid-Cretaceous, Pangea split into several smaller continents and ocean basins (continental configuration illustrated in Figure 2), such as the Pacific Ocean, the proto-Atlantic and the Tethys Sea. The spreading of continents also generated extensive new coastlines resulting in increasing near-shore habitats. Moreover, seasons became more pronounced as the global climate cooled. By the end of the Cretaceous, primordial woods evolved to become more similar to those distributed on Earth today (2). Another intriguing aspect of the Cretaceous period is the warm and stable climate, with tropical and polar temperatures higher than today, lower gradient from the Equator to the Poles, as well as from the land to the ocean and fewer seasonal extremes. Rainfall and atmospheric greenhouse gas concentrations (e.g. CO2, CH4) were higher in the Cretaceous compared to today explaining partly the relatively warmer climate at the global scale. High temperatures extended into the polar regions have prevented the accumulation of ice sheets and reduced the temperature gradient between the Equator and the Poles. This in turn disrupted the mid- and high latitude wind systems, which affected global temperature distribution and the wind-driven ocean circulation (2,5). The lack of continuous winds at mid-latitudes prevented ocean currents from forming and transporting heat from the Equator to higher latitudes. In today’s ocean, the Gulf Stream would be an example of such a current, able to transport heat from the Caribbean area all the way to Europe, making winter months in Europe warmer. During the Cretaceous this heat was transported via small to large scale swirls capable to trap heat and transport it to higher latitudes. The dominating “thermohaline circulation”, i.e. the current global ocean circulation, would not develop until the continental configuration was similar to todays. The chemical state of the Cretaceous ocean was also extremely different. Today, oceans are dominated by oxic (oxygenated) water masses, with the exception of some marginal basins like the Black Sea, fjords, upwelling areas and so-called coastal “anoxic dead zones”. However, during the Jurassic and early Cretaceous episodes local anoxia occurred and this state developed into a global scale phenomenon during the mid-Cretaceous. These Oceanic Anoxic Events (OAEs) represented severe disturbances to the global carbon, oxygen and nutrient cycles of the ocean. One well-known event is the OAE2, which happened during the mid-Cretaceous (120-80 Ma), shown in Figure 3 together with several other OAEs recorded in a sediment core drilled in Northern Germany. The OAE2 was characterized by extreme atmospheric CO2 concentrations, widespread water anoxia and free hydrogen sulfide in the surface ocean (3). Evidence for these global perturbations is recorded in ocean sediments, thus providing an important insight into the Earth’s climate archive. Sediments from this period attributed to OAE2 are known globally for their thick layers of organic-rich black shales. The enhanced accumulation of organic carbon during these extreme events did not only have a significant impact on Cretaceous ocean chemistry and climate, but also played an important role in the formation of oil and gas, over millions of years, which are now extensively exploited as a fossil energy source (4). The resulting elevated levels of carbon burial would account for the Cretaceous Black Shale Formation in the ocean basins and has often been related to increased organic matter preservation due to anoxic conditions, increased oceanic productivity in the surface ocean or a combination of both. 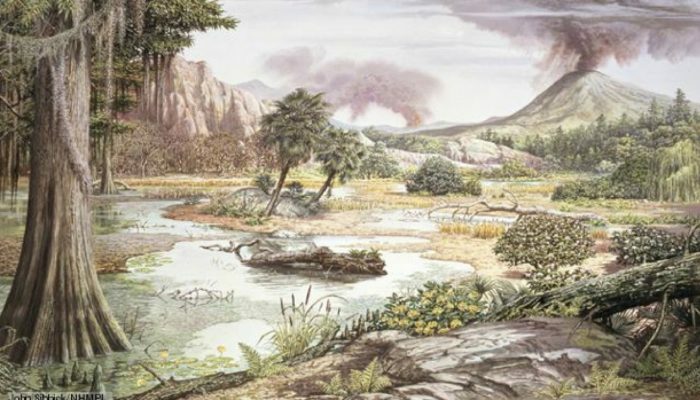 However, the exact nature and background of the paleo-environment that fostered this massive and almost global deposition of organic carbon-rich sediments is still a matter of debate. Two mechanisms are commonly proposed to explain the prolonged oceanic oxygen depletion during OAEs: first, a decreased oxygen supply to the deep ocean due to weaker ocean circulation and second, an increased oxygen demand in the water column resulting from enhanced primary productivity (1,4). In the latter mechanism, the high primary production was caused by the increased nutrient availability in the ocean in combination with high temperatures. This has been shown by following the evolution of the nutrient concentration in sediments from the onset of an OAE to the end of it: Nutrients (phosphorous in this case) accumulate in the sediments prior to an OAE, but their concentrations decrease during an anoxic event. This implies that the nutrients were consumed by primary producers (4). As primary producers die and sink as organic matter through the low oxygen concentration water column, one part of the organic matter is degraded, while the other part reaches the ocean floor, where it is buried layer upon layer, creating thick sediment bands with high concentrations of organic matter. 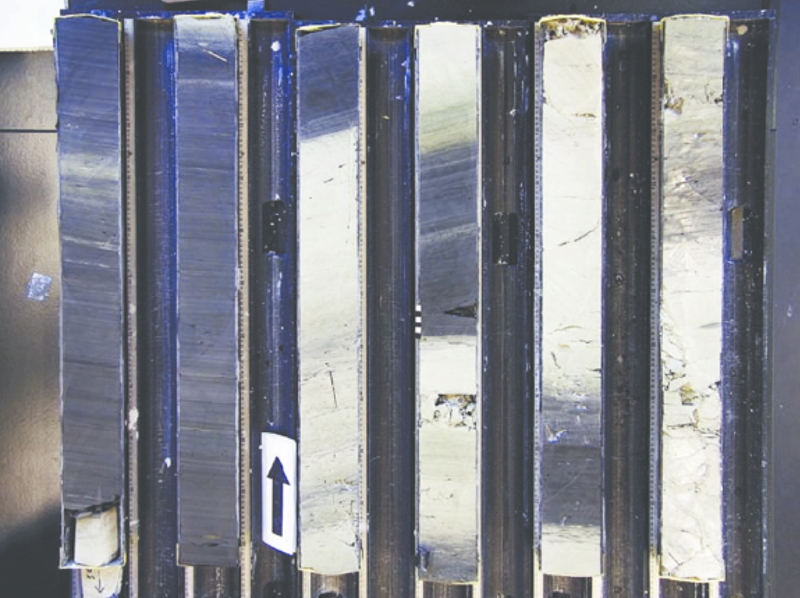 These layers show up as dark laminated layer in sediment cores (Figure 3). Figure 3: The history of Earth can be read from this sediment core. Several transitions between an oxic and anoxic states are visible in this core section (meters 44 to 38 of the Wunstorf core), whereby the black shales represented by the dark laminated layers. This sediment core was taken on land in Northern Germany during the time when this region was under water (mid Cretaceous). These black shales strata offer a unique opportunity to study the evolution of biological, chemical and physical processes in sediments. It allows us to investigate the relation between sediment accumulation and the degradation of organic matter over the geological times. This can bring key information on the evolution of carbon sources and sinks and their possible climate feedback on different time scales. This post has been edited by the editorial board. Arndt, Sandra, Hans-Jürgen Brumsack, and Kai W. Wirtz. "Cretaceous black shales as active bioreactors: a biogeochemical model for the deep biosphere encountered during ODP Leg 207 (Demerara Rise)." Geochimica et Cosmochimica Acta 70.2 (2006): 408-425. Harff, Jan, et al. Encyclopedia of Marine Geosciences. Springer, 2016. Hay, William W. "Evolving ideas about the Cretaceous climate and ocean circulation." Cretaceous Research 29.5-6 (2008): 725-753. Hülse, Dominik, et al. "Understanding the causes and consequences of past marine carbon cycling variability through models." Earth-science reviews 171 (2017): 349-382. Weissert, Helmut. "Mesozoic pelagic sediments: archives for ocean and climate history during green-house conditions." Developments in sedimentology. Vol. 63. Elsevier, (2011): 765-792. Levoglucosan is a molecule that is exclusively formed during the combustion of vegetation at low-temperature. It is therefore considered to be a source-specific tracer for biomass burning. During these fire events, levoglucosan is emitted into the atmosphere and can be transported over hundreds of kilometres. The extent of its atmospheric degradation is currently under debate, however, several studies have demonstrated that levoglucosan remains stable in the atmosphere for several days under most atmospheric conditions. It has been extensively used as a tracer for biomass burning in aerosols in numerous air-quality studies. Levoglucosan can provide information on the occurrence and origin of biomass burning, given that the source area of the levoglucosan is known. So far, levoglucosan is usually interpreted in terms of increased or decreased occurrence of biomass burning. Figure 1: Illustration of levoglucosan transport from the land to the bottom of the ocean or lakes. Recently, the use of levoglucosan as a biomass burning proxy in geological archives has gained increasing interest. Indeed, levoglucosan has been analysed in lake sediments (Battistel et al., 2017), in marine sediments (Lopes dos Santos et al., 2013) and in ice cores (You et al., 2016). It can be transported to these environments by atmospheric transport and by rivers (Fig. 1), where the biomass burning history of the source area is preserved. Seminal advances in the development of this proxy have occurred e.g. on the effect of transport and deposition on the levoglucosan. These molecules are likely transported to the ocean floor attached to marine biogenic particles in the water and do not substantially degrade during settling in the water column (Schreuder et al., 2018). However, they seem to be partially degraded in the top layer of the sediment and therefore changes in preservation conditions over time might influence the levoglucosan record. Other factors that might also influence levoglucosan accumulation are changes in wind strength and direction. This can result in decreasing or increasing transport of levoglucosan to the specific environment where the cores/samples are taken. This illustrates the importance to constrain the factors influencing the levoglucosan record in the context of a multi proxy approach. What are the key findings that have be done using this proxy ? So far, levoglucosan studies have mainly focused on reconstructing fire history of the last few centuries and of the Holocene (e.g. Shanahan et al., 2016; Zennaro et al., 2014), but it has also been detected in sediments up to 130 kyrs (Lopes dos Santos et al., 2013). It shows that levoglucosan has the potential to reconstruct fire history on short time scales (i.e. yrs to kyrs) as well as on long time scales (i.e. kyrs to myrs). 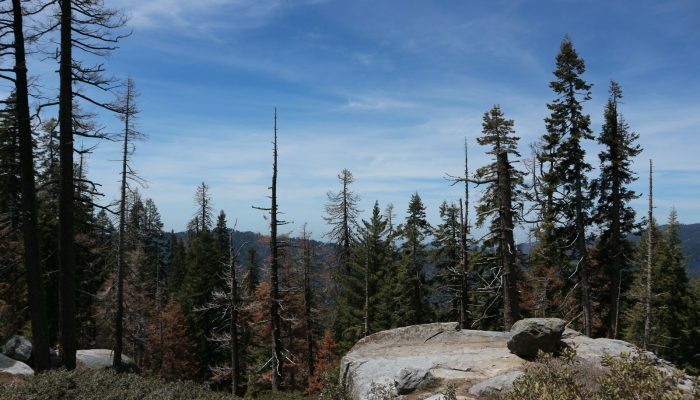 The fire biomarker is frequently used together with proxies for vegetation and climate to get a better understanding of the interactions between fire, humans, vegetation and climate. For example, Lopes dos Santos et al. (2013) used the levoglucosan proxy in a marine sediment core offshore Australia to reconstruct past levels of biomass burning on the Australian continent over the last 130 kyrs. They also studied biomarkers for vegetation composition and archived information on human arrival and extinction of animals heavier than 40 kg (megafauna). They found out that around 44-42 kyrs, vegetation change was the consequence of the extinction of megafaunal browsers and led to the build-up of fire-prone vegetation in the Australian landscape, as illustrated in figure 2. Figure 2: Interactions between fire and the environment in Australia around 44-42 kyears. Battistel D., Argiriadis E., Kehrwald N., Spigariol M., Russell J.M. and Barbante C. (2017) Fire and human record at Lake Victoria, East Africa, during the Early Iron Age: Did humans or climate cause massive ecosystem changes? The Holocene 27, 997-1007. Lopes dos Santos R.A., De Deckker P., Hopmans E.C., Magee J.W., Mets A., Damsté J.S.S. and Schouten S. (2013) Abrupt vegetation change after the Late Quaternary megafaunal extinction in southeastern Australia. Nature Geoscience 6, 627-631. Schreuder L.T., Hopmans E.C., Stuut J.-B.W., Damsté J.S.S. and Schouten S. (2018) Transport and deposition of the fire biomarker levoglucosan across the tropical North Atlantic Ocean. Geochimica et Cosmochimica Acta. Shanahan T.M., Hughen K.A., McKay N.P., Overpeck J.T., Scholz C.A., Gosling W.D., Miller C.S., Peck J.A., King J.W. and Heil C.W. (2016) CO2 and fire influence tropical ecosystem stability in response to climate change. Scientific reports 6, 29587. You C., Xu C., Xu B., Zhao H. and Song L. (2016) Levoglucosan evidence for biomass burning records over Tibetan glaciers. Environmental Pollution 216, 173-181. Zennaro P., Kehrwald N., McConnell J.R., Schüpbach S., Maselli O.J., Marlon J., Vallelonga P., Leuenberger D., Zangrando R. and Spolaor A. (2014) Fire in ice: two millennia of boreal forest fire history from the Greenland NEEM ice core. Climate of the Past 10, 1905-1924. The sporomorphs (pollen grains and fern spores) are cells produced by plants involved in the reproduction. They are microscopic (less than a fifth of a millimeter) and contain a molecule called sporopollenin in their cell wall, which is very resistant to degradation. The sporopollenin molecule allows sporomorphs to be preserved in sedimentary archives such as lake sediment or peat deposits. These reproductive structures appeared during the Paleozoic (570 million years ago) but the first spores looked rather similar and were indistinguishable among species. Later speciation of plants promoted the diversification of the reproductive cells between species and brought the opportunity to relate the fossil sporomorphs found in the sedimentary archives to the parental plant that produced them. Figure 1. Plant communities are different depending on a wide range of environmental conditions. Above: Andean grasslands (páramo) in Ecuador. Below: Swamp forest in Orinoco Delta (Venezuela). Plants are immobile organisms, and each species has its own tolerance range to the existing environmental conditions. The occurrence of certain plant communities in a specific environment depends on their different tolerance ranges. 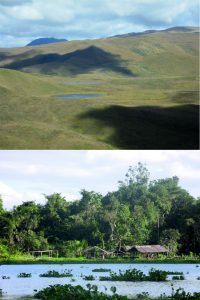 For instance, we do not observe today the same plants growing in the tropical rainforests of South America than in the polar tundra (Figure 1). Paleopalynology is the discipline that helps characterizing which plant species have occurred at a specific location during a particular time period. This provides information on the environmental conditions of the studied region. To identify the different species, palynologists have to analyze under the optical microscope the specific features of the sporomorphs’ cell walls. They look at e.g. the presence of spines or air sacs, or the number of apertures that the pollen grain has (Figure 2). These features are specific for each plant, which allows relating the pollen grain found in the sedimentary archive to the plant that produced it at the study location at a particular period of time. Figure 2. Pollen grains have very different morphologies that allow identification of the plant that produce them. A: Byttneria asterotricha (Sterculiaceae); B: Triplaris americana (Polygonaceae); and C: Calyptranthes nervata (Myrtaceae). Bar scales in the pictures represent 25 micrometers. What are the key findings made using this proxy? Paleopalynology has a wide range of applications in geoscience. For instance, the presence of specific sporomorphs has been used as chronological markers to pinpoint several geological periods, especially in the far past biostratigraphy (million years ago) (Salard-Cheboldaeff 1990). In palaeoecology (the ecology of past ecosystems), the analyses of fossil sporomorphs help in specifying the dynamics of vegetation communities through time. This type of work started a century ago by Lennart van Post (1916) and provided the opportunity to study plants population and community natural trends within the appropriate temporal frame for long-lived species (i.e. tree species such as pines or oaks can live several centuries). Moreover, it provides a unique empirical evidence of the actual responses of vegetation to disturbances that occurred in the past, e.g. natural hazards, human populations land use and other anthropogenic impacts, or climatic shifts. ii) map the re-colonization events and the assemblages formed during the last deglaciation until the vegetation communities we observe today (Giesecke et al. 2017). In addition, in some characteristic environments, such as mountain regions, the occurrence and disappearance of specific species can allow the estimation of the temperature change with respect to present-day conditions. Another example has been developed in the last decade: the study of organic compounds contained in the sporopollenin of the sporomorphs’ walls. It has been identified as an accurate proxy that registers UV-B rays’ signals (Fraser et al. 2014). As UV-B rays’ are related to solar irradiation trends through time, reconstructing the organic compound variations in the sporomorphs’ walls allows reconstituting past solar irradiation trends in continuous archives such as lake and peat deposits. This all shows that despite being a tiny structure, pollen grains are the story tellers of how the planet has been changing through history and can provide a wide range of outcomes essential for geosciences. Davis, M.B. (1981). Quaternary history and the stability of forest communities. In: West, D.C., Shugart, H.H., Botkin D.B. (Eds.) Forest succession. New York, NY: Springer-Verlag. Fraser, W.T., Lomax, B.H., Jardine, P.E., Gosling, W.D., Sephton, M.A. (2014). 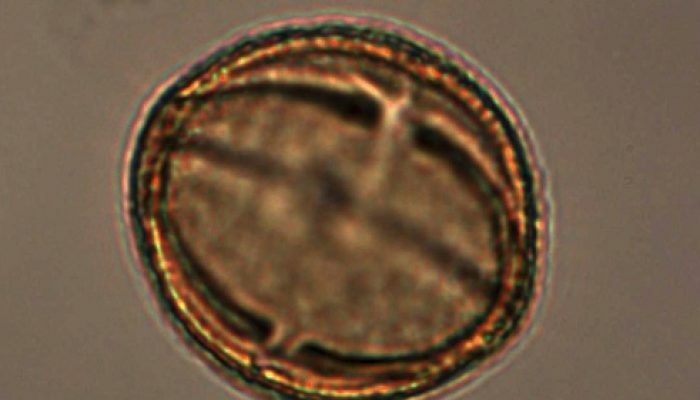 Pollen and spores as a passive monitor of ultraviolet radiation. Frontiers in Ecology & Evolution 2: 12. Giesecke, T., Brewer, S., Finsinger, W., Leydet, M., Bradshaw, R.H.W. (2017). Patterns and dynamics of European vegetation change over the last 15,000 years. Journal of Biogeography 44: 1441-1456. Salard-Cheboldaeff, M. (1990). Interptropical African palynostratigraphy from Cretaceous to late Quaternary times. Journal of African Earth Sciences 11: 1-24. Von Post, L. (1916). Om skogsträdpollen i sydsvenska torfmosslagerföljder. Geol. Fören. Stockh. Förhandlingar 38, 384–390. Williams, J.W., Jackson, S.T. (2007). Novel climates, no-analog communities, and ecologica lsurprises. Frontiers in Ecology and the Environment 5: 475-482. How to reconstruct past climates from water stable isotopes in Polar ice cores ? Ice cores are a favored archive to study past climates, because they provide a number of indications on the history of the climate and of the atmospheric composition. Among these, water stable isotopes are considered as a very reliable temperature proxy. Yet, their interpretation is sometimes more complicated than a simple one-to-one correspondence with local temperature and requires intercomparison with other proxy records, as various processes affect the signal found in the ice cores. All water molecules are not equal: some are heavier due to one of their atoms being substituted with a heavier counterpart (the standard oxygen molecule, 16O, can be substituted by an 17O or an 18O, whereas the hydrogen (H) can be substituted by a deuterium (D=2H)). These molecules (e.g. H216O, H218O and HD16O) are called isotopologues (or isotopes in short, but it’s technically inaccurate), and have each different physical properties. As a result, the molecules react differently to external factors, leading to fractionation (processes that affect the relative abundance of isotopes). The isotopic composition (commonly referred to as δ18O, δ17O and δD) of snow is governed by fractionation from the evaporation site, where the moisture first enters the atmosphere, to the precipitation site where it is deposited to the ground (Dansgaard 1953)(see video below). First, over the ocean, the heavier isotopes are less likely to take part in the formation of moisture, leading to lower concentrations of the heavy isotopes in the clouds compared to the mean oceanic water isotopic composition (lower concentration means that the δ18O is more negative). Then, as the air masses move toward the poles, temperature decreases leading to precipitation (either liquid or solid). The heavier isotopes will be preferentially found in the condensed phase than the light ones, which depletes even more the cloud from its heavy isotopes. Finally, in remote areas of the Polar Regions, the isotopic content of the final precipitation results from successive precipitation events. Since, as we saw, the precipitation contents in each isotope are different, each successive precipitation event will have a different isotopic composition, with the final one having the least heavy isotopes – a process called distillation. At each step of the moisture’s path from ocean to cloud to precipitation, the isotopic fractionation is strongly influenced by temperature. This leads to a temperature signal in the isotopic composition of both vapour and precipitation. This video shows the isotopic fractionation at each step of the water cycle (from the evaporation over the ocean to the location where the precipitation occurs) are integrated, giving the temperature and humidity sensitivity of the isotopic content of the precipitation (modified from Casado (2016)). Over glaciers and ice sheets, snow accumulates and can remain preserved for hundred of thousands of years. Thus, analysing the isotopic composition of these successive layers enables us to retrieve past temperatures. Considering the very low amount of water necessary to obtain a measurement, analysing an ice core can provide continuous and high-resolution time series of past climatic variations. A classic way to retrieve temperature from isotopic composition data is to use the spatial relationship between δ18O of surface snow and surface temperature (e.g. Lorius and Merlivat (1975) for Antarctica). That is, to measure simultaneously the present-day temperature and the δ18O of surface snow across the study area and to make use of their linear spatial relationship to infer past temperatures from the δ18O of the ice core. However, one should keep in mind two main limitations when using such a method. First, it assumes that the spatial relationship between δ18O and temperature is a good surrogate for the temporal δ18O versus temperature relationship. However, this link is known to change with time (and hence depth of the snow deposit). Second, processes occurring after the snow has fallen, such as sublimation or blowing wind, can affect the way the snow is layered in the ice core, as well as its isotopic composition. The local accumulation (expressed in cm of snow per year) is a determining factor for both the extent of an ice core record and the maximal resolution that can be achieved. As the present-day ice thickness is capped between 3 and 4 km, it is necessary to choose a site with low accumulation to obtain an ice record spanning several glacial/interglacial (i.e. warmer and colder) cycles (Fischer et al. 2013). For instance, the NGRIP ice core in Greenland was retrieved in one of the thickest part of the Greenland ice sheet (see Figure 1. b)). Similarly, the Dome C ice core (the ice core spanning the furthest in the past to date which is 800,000 years before present) was retrieved in an area of Antarctica where the ice sheet was very thick (more than 3000 meters) and the accumulation very low (roughly 2.5 cm per year). Figure 1: Greenland and Antarctic ice core sites: (a) Isotopic signal from the NGRIP, (b) and (c) maps of ice thickness in Greenland and Antarctica, respectively, and (d), isotopic signal from the Dome C. The isotopic signal for both sites is presented against the depth (left) and with the associated age model (right), warm periods are shown in grey to indicate the correspondence between age and depth in the ice cores (Casado et al, 2017). For sites with low accumulation, the snow stays exposed at the surface for a long time. Hence, the initial precipitation signal is modified by local processes occurring after the snow has fallen (Ekaykin et al. 2002). This prevents proper recording of the signal at timescales below several years, for sites with accumulation lower than 8 cm per year (Münch et al. 2016). Deeper in the ice, diffusion processes smoothen the isotopic composition time series, erasing part of the climatic signal (Johnsen 1977). 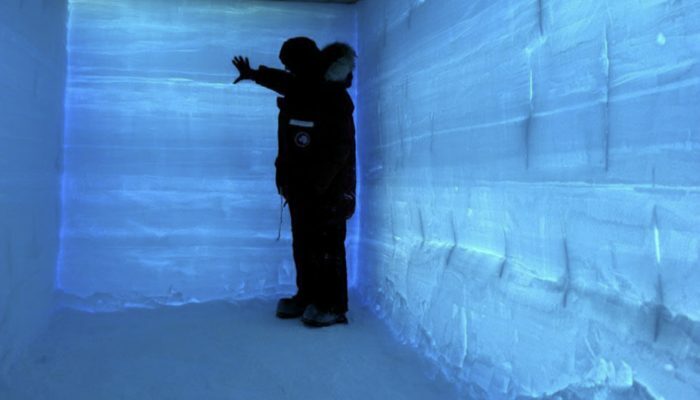 This limits the interpretation of ice core records at time scales smaller than a few decades. Finally, retrieving a temperature signal at high resolution for longer time scales remains a challenge because of the varying relationship between δ18O and the temperature deeper in the ice. The first limitation is the accumulation rate itself, which is typically lower during glacial periods. The temporal resolution also gets lower with depth as the ice thins due to the increasing pressure exert by the overlying ice layers. As illustrated in Fig. 1, the number of years per meter globally increases with the depth of the record, from roughly 20 years per meter at the top of the core at Dome C up to 1,400 years per meter for glacial periods at the bottom. Overall, the variability found in single ice core records combines both the climate variability and several signatures from other local processes affecting the snow. The temperature signal retrieved from δ18O can be tested against independent temperature time series, such as borehole temperature measurements at the ice core site, to aid in reconstructing the correct δ18O versus temperature relationship (the so–called “calibration” process). The temperature of the borehole from which the ice core was extracted is measured at different depths. Small variations in these temperatures provide a reliable but low-resolution measurement of past temperature changes as the ice is a good thermal insulator. Measurements performed in Greenland have suggested that the use of the spatial δ18O versus temperature relationship described above underestimates by a factor of two the magnitude of the temperature change between the last glacial maximum (LGM, the last period when ice sheets were at their peak extension) and the present-day (Cuffey et al. 1994). Jouzel et al. (2003) confirmed this using computer simulations, and further showed that the δ18O versus temperature relationship does not remain constant over time. This large variability can be due to differences in the large-scale atmospheric circulation, vertical structure of the atmosphere, seasonality of precipitation, modification of location of the moisture source regions or of their climatic conditions. Figure 2: Relationships between isotopes and temperature for different locations and timescales (indicated along the horizontal axis). A higher value would lead to higher temperature difference estimate for the same δ18O difference (Casado et al, 2017). Calibration of the isotopic paleothermometer is therefore essential, and is realised through different methods. Station data can be used at the seasonal and interannual scales, isotopes of other gases at decadal to centennial scales (Guillevic et al. 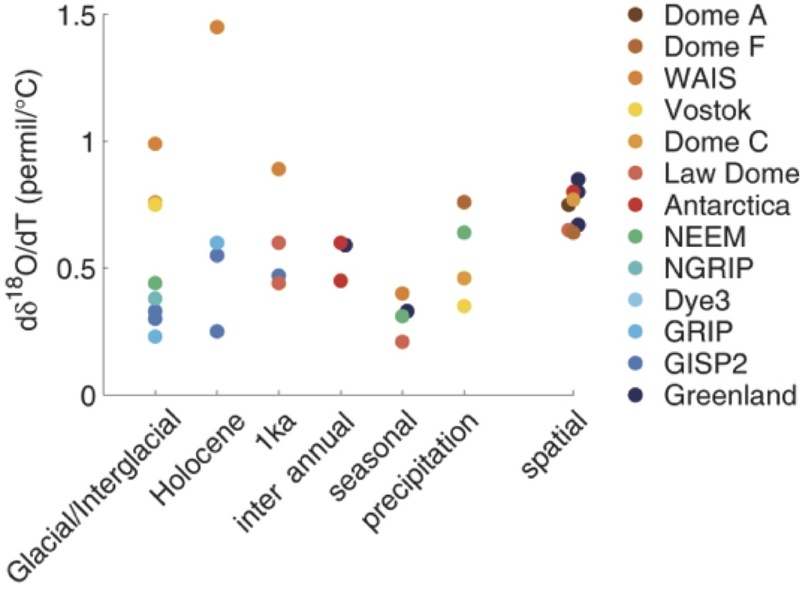 2013) and borehole temperature measurements at millennial scales (Orsi et al. 2017). Finally, climate models which represent isotopic processes (called “isotope-enabled”) can be used to infer the isotope-temperature relationship with a direct control on the time scale and on the period. For instance, Sime et al. (2009) highlighted that for warm interglacial conditions, the isotope-temperature relationship can become non-linear whereas it is not the case for cooler (glacial) conditions. The δ18O versus temperature relationships found in the literature (Fig. 2) span values ranging between 0.2 ‰/°C to 1.5 ‰/°C. From this compilation, it is clear that a more complex framework than simple linear regression to temperature is necessary to interpret the isotopic signal. If water isotopes from ice core records are insightful tools to reconstruct past climates, there are fundamental limits to their power of reconstruction. The above therefore calls for a careful use of isotopic records when these time-series are used for general inferences about the climate system (e.g. Huybers and Curry (2006)). A possible way forward is to use isotope-enabled global climate models (Sime et al. 2009). A complementary approach is to undertake process field studies (Casado et al. 2016), which can help to evaluate how the isotopic signal is modified after the deposition, and how the relationship between isotopes and temperature is altered at the seasonal and inter annual timescales. The Beyond EPICA – Oldest Ice project plans to retrieve an ice core in Antarctica in which over 1.5 million years of climatic record could be retrieved. This will enable to go further back than the 800, 000 years old ice core obtained at Dome C and thus, would be a breakthrough into studying the changes in orbital forcing during the mid-Pleistocene transition (900 to 1,200 thousand years ago) during which the glacial-interglacial cycles shifted from lasting 41, 000 years on average to 100, 000 years. Welcome to the blog of the Climate: Past, Present and Future (CL) Division of the European Geosciences Union (EGU). It cover all aspects of the ocean-climate-atmospheric systems, encompassing multiple, over-lapping and complementary disciplines, from the state of the current climate to modelled predictions of future climatic scenarios, and the reconstruction of past climatic change. The blog is edited by Célia Sapart who welcomes guests posts. How earthworms can help us understand past climates? God does not play DICE – but Bill Nordhaus does! What can models tell us about the economics of climate change? What can artificial intelligence do for climate science? How glowing sediment can help to decipher the Earth’s past climate ! Unless otherwise indicated, the content on this blog is licensed under the Creative Commons Attribution 4.0 International licence (CC BY 4.0).